Thursday's 10-year TIPS reopening looks likely to get a real yield to maturity of around 0.64%, well below January's 0.919%. The U.S. Treasury will offer $11 billion in an auction Thursday of a reopened 10-year Treasury Inflation Protected Security, CUSIP 9128285W6. This TIPS, which originally auctioned January 17, carries a coupon rate of 0.875%. Its principal is adjusted higher (or lower) each month to match inflation. I'm not a fan of buying a 10-year TIPS in the midst of a seemingly short-term swoon in real yields ... However, what if you believe that interest rates have topped out and are heading lower? In that scenario, you should consider being a buyer at Thursday's auction. Check Bloomberg's real-time Current Yields page and you'll see that at the close Friday, it was trading with a real yield of 0.64% and a price of about $102.22 for $100 of par value. (Buyers at the originating auction got it at a discount, about $99.41). You can double-check Bloomberg's data by looking at the Wall Street Journal's Closing Prices page, which lists this TIPS as maturing 2029 Jan 15. It closed Friday with a real yield of 0.639%. Finally, you can track yield trends for 10-year TIPS by viewing the U.S. Treasury's Real Yields page, which estimates yields for full-term TIPS. The Treasury estimates that 10-year real yields fell from 0.80% on March 1 to 0.65% on March 15. One side note on this TIPS: It will carry an inflation index of 0.99669 on the settlement date of March 29, which reflects the near-zero inflation of recent months. Investors, essentially, won't be buying any inflation-adjusted principal. With a 10-year nominal Treasury currently yielding 2.59%, this reopened 10-year TIPS will get an inflation breakeven rate of around 1.95%, a bit higher than the originating auction's 1.83%. I'd say this breakeven rate is "fair value," meaning this TIPS is neither cheap nor expensive versus a nominal Treasury. If you think inflation is going to average higher than 1.95%, buy the TIPS. If not, buy the nominal Treasury. (Inflation has been running below expectations over the last 10 years, averaging just 1.8%, which I discussed in this article). I can't recommend buying a 10-year TIPS with a real yield of 0.64% when U.S. Series I Savings Bonds currently carry a fixed rate of 0.50%. That fixed rate, available for purchases through April 30, is equivalent to the I Bond's "real yield." 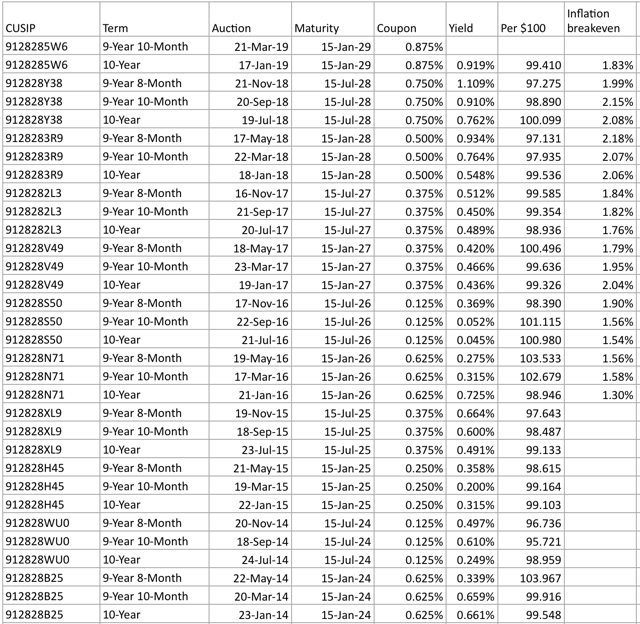 A spread of 14 basis points between an I Bond's fixed rate and a 10-year TIPS's real yield is very low. Back on November 1, when the Treasury set the Bond's fixed rate at 0.50%, this spread was 60 basis points. The after-inflation return on I Bonds typically lags the return on TIPS by at least 50 basis points, and sometimes well over 100 basis points. Why? The I Bond has advantages of flexible maturity, tax deferral and solid deflation protection, so some spread is justified. So, for investors looking for inflation protection, I'd recommend first buying I Bonds up to the Treasury's limit of $10,000 per person per year in electronic form at TreasuryDirect.gov. (You can also receive paper I Bonds up to $5,000 in lieu of an income tax refund). There are zero fees, commissions or carrying costs. The Treasury will reset the I Bond's fixed rate on May 1, and the data indicate - at this point - that a lower fixed rate is likely, possibly a dip to 0.3%. I'll be looking at this in more detail next month, but at this point I'm recommending buying I Bonds before April 30 to capture the 0.50% fixed rate, which stays with the I Bond until it is redeemed or matures. Yes or no on this auction? Obviously, I Bonds are a product for small-scale investors, and TIPS are targeted more toward big-money investors, where $10,000 is a rounding error. This TIPS reopening should draw decent demand because of its "fair" inflation breakeven rate and the current trend of declining real yields. Some traders may see an opportunity for capital gains if real yields continue to fall sharply.